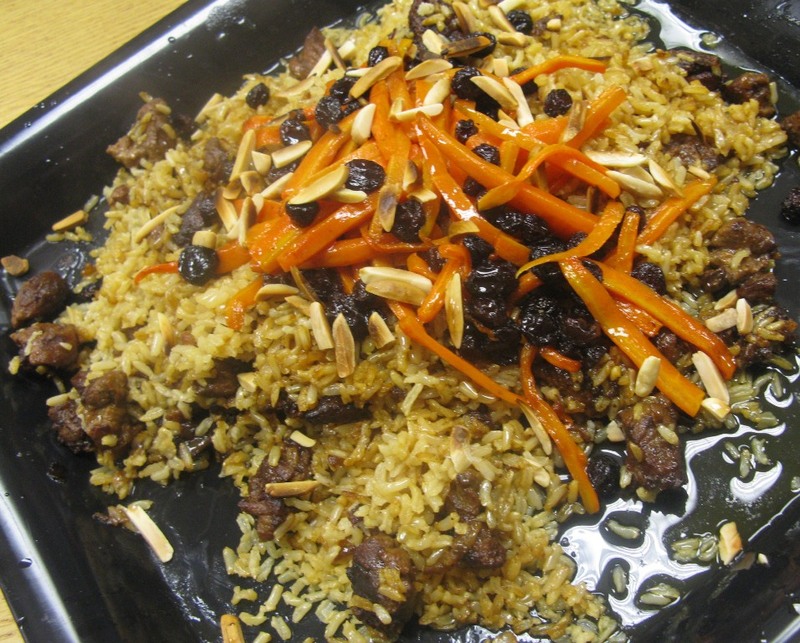 Kabuli Pulau, a pilaf of rice, meat, carrots and redolent spices, is said to be the national dish of Afghanistan. We made ours with lamb and quickly became intimate with the dish’s rustic origins. This is one of those treatments that requires several cooking vessels to prepare various elements, all of which come together in the end to be baked in the oven in a big pot. Imagine your entire clan sitting around a giant platter piled high with steaming rice dotted with chunks of browned lamb shoulder, carrots, raisins and toasted almonds. Well, we kept the pile rather smaller in our food appreciation classes. As I never cease to remind the kids, we are making something to taste, not dinner. But the proportions listed here will easily feed a family of four as an entree. I think kabuli palau is best approached one element at a time. Altogether, you will need two skillets–one small, one large–a medium saucepan, a heavy pot or dutch oven and a baking sheet. To start, scatter 1/2 cup slivered almonds on an ungreased baking sheet and toast in a 350-degree oven until lightly browned. Scrape the almonds onto a small plate and reserve. Next, wash 1 cup long-grain brown rice (we used Basmati) in a colander, then transfer to a medium sauce pan and cover with 2 cups water. Season with a generous pinch of salt and bring to a boil. Lower the heat, cover and cook slowly to al dente (chewable). You don’t want to cook the rice completely at this point because it will be transferred later to another pot to bake in the oven. Set rice aside. Meanwhile, chop one medium onion into small dice. In a large, heavy skillet greased with 3 tablespoons extra-virgin olive oil, brown the onions lightly over moderately high heat. Add 1 pound lamb shoulder (or leg of lamb) cut into 1/2-inch dice and seasoned with salt and pepper. Brown the lamb and onion together, stirring occasionally and scraping the bottom of the pan to prevent onions from burning. When the lamb has browned, drain off any excess grease and add 1/2 cup chicken stock to the pan. Stir, scraping the sides and bottom of the pan well. Allow the liquid to boil for a few minutes, until it has reduced to a thick gravy. Stir in 1/2 teaspoon cumin, 1/2 teaspoon ground cardamom and freshly ground black pepper to taste. Remove pan from heat and reserve. For the fourth element, peel 1 large carrot and cut into three pieces of equal length. Slice these into thin matchsticks. Place in a small skillet, cover with water, bring to a boil and cook until the carrots are almost cooked through. Drain off the water and place the skillet back on the heat. Add 2 tablespoons olive oil and a generous fistful of black raisins to the pan and cook fairly aggressively, until the raisins have plumped. Remove from heat. Scrape the cooked rice into a heavy pot or Dutch oven and pour in 1 additional cup chicken stock. Scrape the lamb and onion mix on top of the rice. Separately, spoon the carrots and raisins onto a sheet of aluminum foil. Draw the corners of the foil together and twist into a tightly sealed bundle. Place this bundle on top of the meat inside the pot. Cover the pot and place in a 500-degree oven for 10 minutes, then lower the heat to 250 and cook an additional 30 minutes. When the pot is removed from the oven the rice will have completely absorbed the chicken broth and the dish will be redolent with spices. Remove the aluminum bundle and spoon the rest of the contents onto a platter. 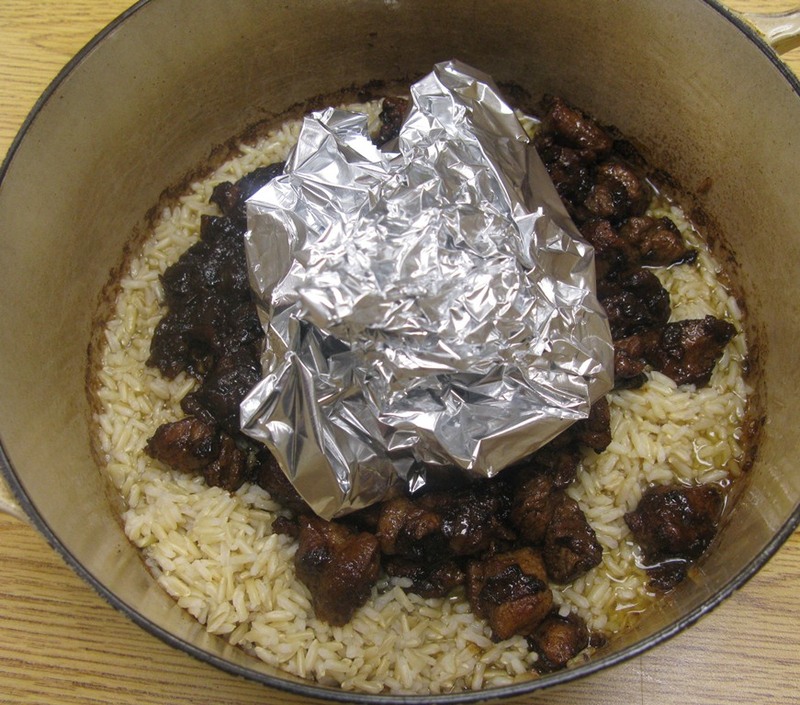 Carefully open the foil (it will be hot) and spread the carrots and raisins over the top of the rice and meat mix. Finally, garnish with the toasted almonds. At this point, you could display your finished kabuli pulau on the dining table as the work of art it is, or spoon it onto individual plates. It would also make a terrific buffet dish served warm. Why do you cook the carrots and raisins in the foil packet? This looks tasty.